Leave us a link so we can check yours out! Recipes can be found on our host blogs. Go check out Emily (photo above) of Capitol Region Dining and Raelynn of The Place They Call Home. Two side notes – this is a link only post. Chatter is encouraged in our chatter post. Anything other than links will be removed. Occasionally links and comments end up in the spam filter. Please don’t leave comments or links multiple times. We check for spam pretty frequently and will get your comment and/or link approved as soon as we can. Mixed feelings about this one, but a great adventure nonetheless! The article is now visible on my blog… So good night everybody! Mine will post at 8:00 a.m. tomorrow. Goes up at 7 tomorrow morning! http://wp.me/p29cDF-32 Happier with its pretty pie looks than its “eh, it’s good…” taste, but still pleased to make it! Live at 5 am ET. My link will go live at 1am! Everybody around me (and myself included) really enjoyed this. I really enjoyed this recipe. Turns out I was already using the dough for sweet pies. Thanks for a great group! waited until midnight, not sure why date says monday… GRR!! My link will go live at 4am MST. Thank you ladies!! We enjoyed it! This is my new favorite crust!! Made with Italian sausage and love! I thought it was tasty, but the rest of my family not so much. Excited to see all your pies! decided at the last minute to join in! Buon appetito! I made the pizza also with spinach, but added some corns too. The “side dish” was a very delicious spinach cream soup. I will be making it again but in a glutten free version! Never had this kind of pizza before. A cozy, hearty meal – better than expected! Here is mine…..So happy to have joined the group : ). Spinach and Sun Dried Tomato Pizza Rustica! I posted, then almost forgot to leave my link. Doh! This was *great*. Loved it. Here are my lovely pizzas! Completely delicious and easier than I anticipated. added a few extra things to mine to give it a little kick. so tasty! http://bakingwithdorieandjulia.wordpress.com/ Fresh off the blog press! Here is my link to Pizza Rustica with olives and sun-dried tomatoes.. Very pleasantly surprised with this recipe. I see by the post ahead of mine that I am not the only one who used olives and sun-dried tomatoes! I made a lactose-free goat cheese version. It was Yummy! http://laurensplate.wordpress.com/ Business lunch was a success! Everyone loved it!!!!!!! Absolutely delicious!!! Looking forward to making for my family this weekend! I used the leftover dough to make a blueberry crostata too. having a lot of trouble leaving my link!!! Finally, my Pizza Rustica is ready! I think I’ve mastered this process! And I’m even on time! I changed mine up a little bit by adding cream cheese to replace half the butter in the crust and rosemary instead of parsley. Perfect light dish! Geez would help if I knew what day it was… http://bakeologie.blogspot.com/2012/04/twd-pizza-rustica.html, I’ll probably accidentally go to work Saturday at this rate…. Here’s mine – at least I got it done during the right week! 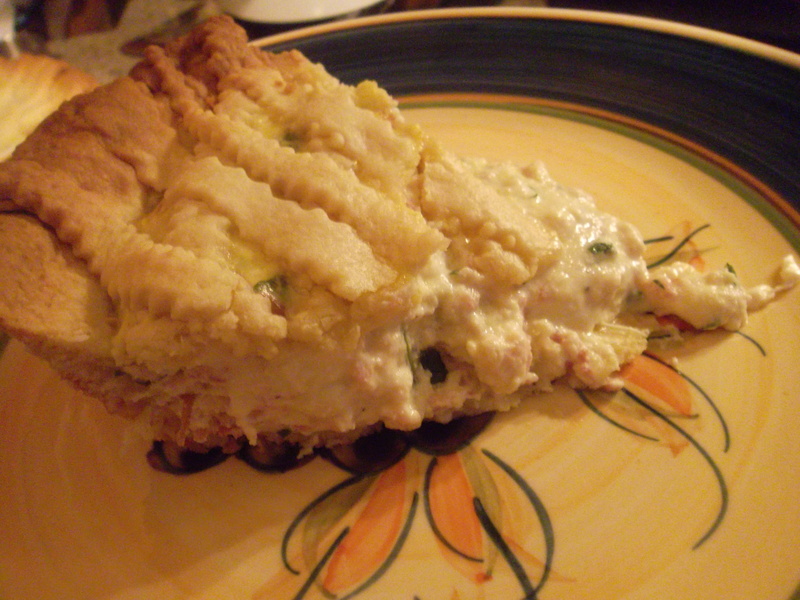 Just finished the Pizza Rustica. Not a hit. Even the kids were not impressed with the sugary crust. Hmmmm. I wanted to add tomatoes but really like to keep with the original Julia recipes. Oh well, it did say Cookies in the description. Late again but here it is. Gluten Free Crust, Mushroom and truffle filling version! Loved this, sorry the post is so late!